Maybe you have a unquenchable desire for tortilla chips like I do. If that is the case, you may really be interested in finding a recipe for baked tortilla chips that you can make yourself that will save you so much in the way of fat and calories over regular tortilla chips. This just might be the right recipe for you. These baked tortilla chips are pretty easy to make and usually turn out quite crispy and delicious. They can satisfy that craving for crunchy salty chips but are far easier on the waistline. While it used to be sort of easy to find baked tortilla chips in the chip aisle, they have certainly become less popular. 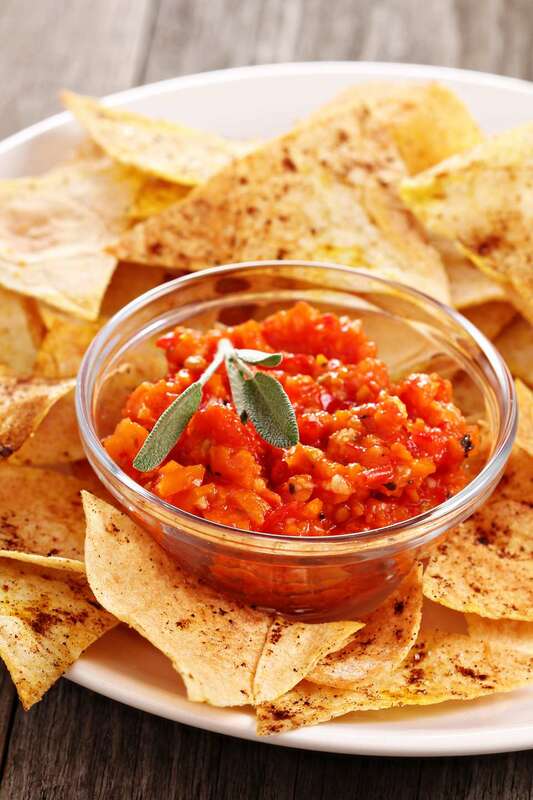 That is why making your own baked tortilla chips can be quite a nice thing if you like having a few chips for a nice bowl of salsa any time of the day. The nice thing about this recipe is that you are not totally starting from scratch. The chips are made from premade corn tortillas, so all you have to do is cut the corn tortilla into triangles to make the chips. We have found a few time-saving tricks along the way that make the job of making these chips just a little bit easier. Using a pizza cutter to slice the corn tortillas into triangles seems to be the most efficient way of making beautiful, uniform tortilla chips. Then, once the chips are made, serve the chips up with your choice of salsa or guacamole, or simply eat them by themselves for a nice salty, crispy, tasty snack. Slice each corn tortilla into 8 triangles. To slice the tortillas with a pizza cutter, simply lay the corn tortillas flat. Then cut each in half. Then cut the tortilla in half again 90 degrees the other way. Then cut each fourth in half and you and up with eight uniform triangles. Next, place the tortilla triangles in a single layer on a large baking sheet that has been coated with a light layer of cooking spray. For extra flavor and crispiness, next, spray each triangle with just a bit of cooking spray, and sprinkle the salt evenly over all of the "chips". Place the tortilla chips in the oven, and bake them for 10 minutes, or until they begin to become crisp and they are lightly browned only near the edges. Be sure not to overcook the chips or they may become burnt and will not taste very good.